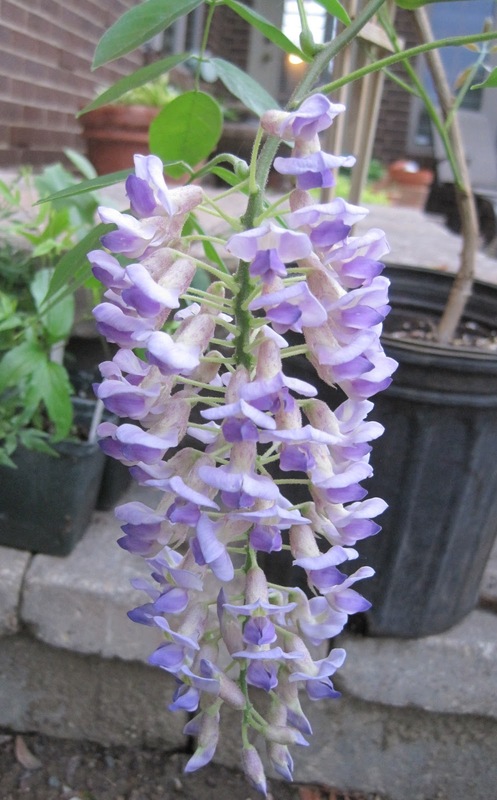 If one is going to do something impractical like purchase a wisteria, at least purchase a native wisteria like Wisteria macrostachya, sometimes referred to as the Kentucky wisteria. This is a woody vine that grows up to 25 feet so it will need some support, some strong support. I've just about figured out how I'm going to provide that support. I need a bit of lumber, some strong nails. In fact, I've figured out enough about the support to convince myself to go ahead and plant the wisteria. So I planted it. Now I've just got to finish building that support before the wisteria really gets growing. What a beauty. It is worth all the extra effort of a sturdy support. Or you could try growing it as a small standard tree. Although I've never tried it (no room) I've seen a few here in the UK. You'll need a solid post for the trunk and the head will need to be kept small until the trunk has thickened enough to support the weight - but the end result can be quite spectacular - and very different. Wisteria is never a bad choice...as long as you pay attention and take care of it! But that is true of many plants. I think you will get many years of enjoyment from your purchase. 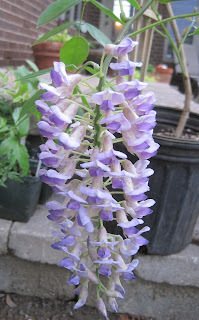 Carol, A landscape designer friend recently wrote on wisteria. I think you would find the resulting discussion and comments interesting. (http://melissaclarkphotography.wordpress.com/2012/04/21/wisteria-wild-or-wonderful/). I concluded that a native wisteria was probably worthy of consideration though I would never plant chinese wisteria again. So pretty! I like the idea of training it into a tree, too. Wisteria is just beautiful. It can definitely be trained into a tree form by braiding the vines and staking it...just wrote a post about it on my blog. I trained a vine into a tree and now have magnificent fragrant blooms every spring. I like your Clematis integrifolia very much, I think I have one in my garden too! But mine does not bloom yet, Germany is a little bit colder it seems!